Until he got to Haywood Street Respite, David Griffin was traveling a rough road, one he inherited from his alcoholic father. After decades of his own struggles with the bottle, he’s on a smoother path now and helping others, thanks to his involvement at Haywood Street Congregation, a United Methodist mission congregation in Asheville, N.C.
At age 8, David and three of his nine siblings were sent to a Baptist orphanage in Thomasville, N.C., to escape his father’s drunken abuses. David had gotten a lot of attention because he survived a near-miss with death at his birth, and he was the baby. But he noted that structured life has its merits: still he can’t stand to leave his bed unmade. He was moved to Broyhill Children’s Home in Clyde. He was developing his athletic skills and things were better there. But Griffin talked them into letting him go home one summer. He left drugs, but then went back. His attitude was, “Everyone else has a problem, but not me. I realized I had a problem so I went into Oxford House,” a residence designed to aid recovery. “For 18 months, I was clean, then I left and lost everything within three and a half months,” Griffin said. He moved into their family home where his brother lived and relapsed after five weeks. Later, Griffin had an episode with his gallbladder, then another, and had surgery. The surgery changed his plans. He couldn’t be recovering and properly caring for his wound without a safe place to stay. Yet he had no home to go to when he got out of the hospital. He was frustrated that he couldn’t find or remember the name of Haywood Street. “Then a gentleman (whose name he doesn’t know) walked in my room and said he was from Haywood Street Respite. It was like a blessing from the Lord,” Griffin says. Haywood Street Respite is a home-like environment where adults experiencing homelessness can stay for a few weeks after being discharged from the hospital to finish their recovery. It is a program of the Haywood Street Congregation, a faith community whose members are as likely to live under a bridge as in a nice home. At the Respite, work is done to connect folks with community supports and, if appropriate, substance abuse treatment services. Many are ready to engage in treatment after a health crisis. Ongoing participation with the Haywood Street Congregation provides a source of strength for the journey of sobriety. Whatever, he’s approaching a year clean and sober. “I stayed after it. My higher power is Jesus Christ,” Griffin said. He was raised in a Baptist church where sin was the usual topic. David not only attends Haywood’s Wednesday services, but frequently goes back to Respite for morning prayers and uses a friend’s car to drive current Respite patients to and from their doctor’s appointments as needed. “Haywood Street is about 75 percent of my progress.” “I want to help people,” Griffin said. Jody recognizes that Haywood Street Respite is an important part of David’s sobriety and is grateful for the role he now plays keeping the program running. She often depends on “Griff” to cover for staff when attending meetings or otherwise occupied. The Respite has been in operation since 2014 and can care for up to eight people at a time who have no place to go after hospitalization. Of 170 individuals served, 80 percent have gone to live somewhere other than the streets or camping upon departure. Some have gone to stay with friends and family. Others were accepted into a transitional housing program, secured an established bed with one of the shelters, or enrolled in an in-patient substance abuse treatment program. 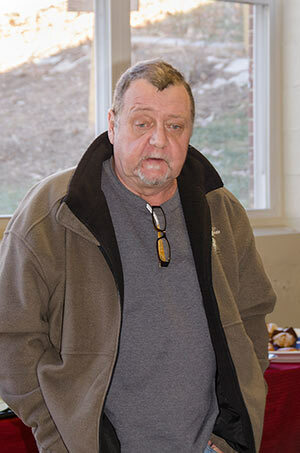 A few were able to move directly into their own place, often with help from Homeward Bound WNC. Haywood Street Congregation was founded in 2009 by the Rev. Brian Combs, a young United Methodist pastor responding to a call to reach out to men and women living on the margins with a message of acceptance and belonging. The ministry has grown rapidly, and today between 300 and 400 gather each Wednesday for table fellowship and worship. Many are recovering addicts and alcoholics who, like Griff, name this community an important part of their support system. The Respite Care Program of Haywood Street Congregation is one of three recipients of the Justice and Reconciliation Team’s “Lazarus Award” for its efforts to restore addicts to health and wholeness.